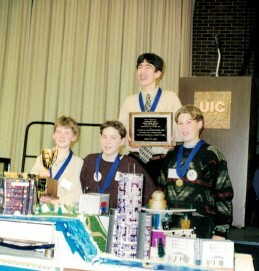 In 1998, four best friends, including Adam Patinkin and Brian Freedman, joined the Future City Competition in Chicago. “When you have a great teacher it can inspire you to push yourself in something outside your comfort zone,” said Adam. “Since I am a more visual learner it was great to be able to grasp science and engineering concepts through SimCity,” added Brian. That year the theme was to devise a creative engineering solution to an urban problem. The guys worked together to create their city, Seolforis, which means “silver ice” in Latin. “We built our city using the recycled materials as it says in the rules, and still to this day, I am always looking for recycled materials that would be good for a city model,” said Adam. To their surprise, they won the regional competition and Finals in Washington, DC. “No matter the outcome, the experience can help shape your life. It teaches you so many lessons from teamwork, to STEM, and even how to give a strong handshake,” says Brian. “What I took away from the competition was how we were treated with respect by adults in the engineering industry. They took our ideas seriously and it felt like they were looking at us as peers which is rare when you are a kid. It really helped to build our confidence,” adds Adam. Adam and Brian's Future City team in 1998.